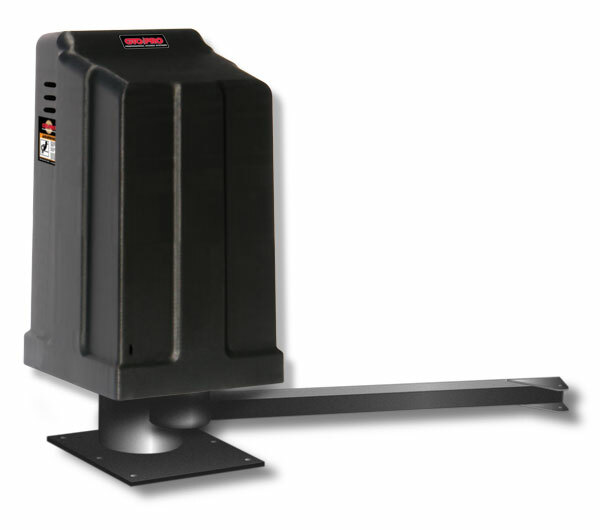 GTO has a full line of state of the art AC powered swing automatic gate operators. They are controlled by self diagnosing microprocessor based control boards. They feature inherent obstruction sensing, which will reverse direction and stop in either the open or close cycle, if an obstruction is encountered. This safety feature is independent of any external safety devices connected to the system, such as safety edges or photo beams. • 12 Vdc, 300mA (.3 Amp), poly fuse protected auxiliary power output. The GP-SW050 Swing Gate Operator:The GP-SW050 is designed for continuous duty operation of swing gates. Max Gate; Weight 650 lbs. swinging in good working condition on a level plane. The GP-SW050 has been discontinued.